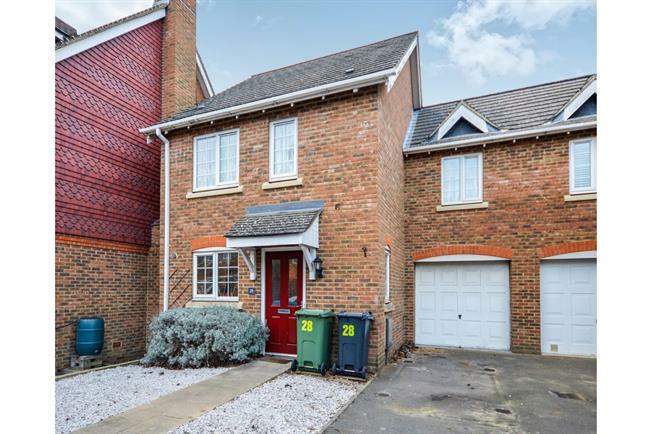 3 Bedroom Semi Detached House For Sale in Ashford for Offers in the region of £250,000. Mann are excited to bring to the market this well presented three bedroom property. The accommodation consists of a good size kitchen, large living room and a conservatory with patio doors opening onto the landscaped garden and W/C. The upstairs comprises of three double bedrooms. The master benefits from fitted wardrobes and a shower en suite. There is also a three piece family bathroom on this floor. This property not only offers great living space but good size bedrooms meaning there is no need for compromise. Other great benefits to the property include a garage with a drive way and a good size rear enclosed garden! This property should be top on your 'MUST VIEW' list. Contact Mann to arrange your viewing today! Radiator, laminate flooring, under stair storage, ceiling light. Radiator, spotlights. Composite work surface, built-in and fitted units, stainless steel sink, integrated oven, integrated hob, overhead extractor. Triple aspect double glazed uPVC windows overlooking the garden. Radiator, laminate flooring, ceiling light. Double bedroom; double glazed uPVC window. Radiator, carpeted flooring, a built-in wardrobe, ceiling light. Heated towel rail, part tiled walls, ceiling light. Standard WC, single enclosure shower, pedestal sink. Heated towel rail, part tiled walls, ceiling light. Standard WC, panelled bath with mixer tap, shower over bath, pedestal sink with mixer tap.